When I was a young boy in grade school I remember sitting in first grade, looking out the window, watching as the trees lost their leaves. One colorful leaf at a time slowly dropping, gliding to the ground. One day while looking out, a small truck pulled up with something in the back, covered by a burlap cloth. Shortly before lunch it was announced by the Principal that we would all be gathering outside in the playground for a function at one o'clock. After lunch, three hundred of us all stood around the playground in an area of the lawn watching as a man planted a tree in honor of Arbor Day. We each were given a small paper cup and walked up to pour a small amount of water on the tree. Each day we took turns watering the tree with a few cups of water. In the summer time, several students were assigned the task of watering that tree. This tradition continued for many years, eventually falling on the children of the children who had attended the school. Twelve years ago that school was torn down as it had simply grown too old to maintain, a sad moment for many of us who had gone there for so long. A new school was built in its place and although even the playground was torn apart and rebuilt, the tree remained. Several people who remembered planting that tree so long ago put to-gether a group of people that cared for the tree. I am one of those people, part of what we call the Tree Givers. Our town has five thousand, twenty residents. People have come, people have gone, some were born while others have died. We have faced droughts that lasted months yet throughout it all, we have cared for the tree, that great oak tree that stands in the yard of the elementary school. We have watered it when we couldn't afford to and have taken care of it when we didn't have time. The tree now stands about forty feet tall with branches reaching out in hundreds of directions, providing shade for the chil-dren as they play on the playground. We have watered this tree and cared for it, providing it with water and love over the years. Helping it to spread its roots deep into the soil of our town and the hearts of our people. I lost my grandfather last year. He was that man who pulled up in that truck so many years ago and planted a tree from our farm. 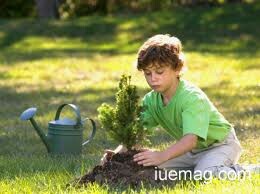 It is because of him that I have strived to care for that tree. If I could have one piece of advice, it would be, find yourself a tree. It doesn't have to be made of wood. It can be that little girl who needs a mother or little boy who wants to play baseball or elderly woman who needs a friend. Water it. Nurture it. Help it to grow in defiance of strife, hunger and pain. Help it to be your future and live with the knowledge that you helped it to reach its fullest potential, because my grandfa-ther lives on in that tree that he planted and if I have my way, his tree will live on forever with its roots planted firmly in our town.